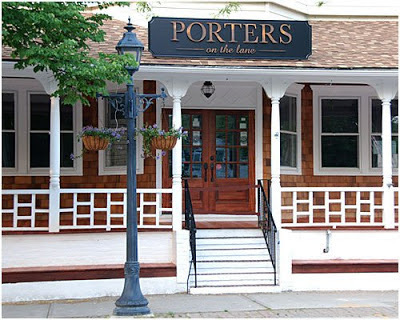 We stopped into Porters on the Lane really on a whim because we were in the area and were hungry for lunch. I wanted something quick and cheap so I warned my husband that this was NOT what we were looking for and quite the opposite but he insisted on going in, so we did. We were greeted immediately and seated along with a high chair for our little one. Others began to stare thinking we were going to be disruptive apparently because of having two kids with us. Mike even overheard a woman telling her husband that she didn't want to sit next to us and would rather move but her husband told her that it wasn't a big deal and that if she really didn't want to sit there she should have said something sooner.....now that I felt like we were were in stuck-up-ville, it was time for lunch. We glanced over the menu and Mike realized I was right. This place isn't cheap. Prices are a little up there for certain items but the sandwiches were priced alright. We ordered the Baked Clams appetizer for $9 which was made up of four tiny clams, but at least they tasted good! I ordered a Grilled Chicken Sandwich that came with guacamole and a spicy mayo on it that gave it a nice touch. Mike ordered the Burger which he enjoyed as it was cooked very well. The fries that came with the sandwiches were also very good. House-cut, and served hot and crispy. Service was fine. Our waitress was very professional and didn't even use a pad for the order. Bus people were good at refilling water on our table and cleaning up any mess. As for the restaurant itself, it has a simple, nautical theme. However, when you walk into the restaurant you first see the bar, as well as a chalk board while you walk into the dining room that states "$10 Burger & Beer At the Bar." All the while having lunch, we heard crappy music coming from the bar area that although not loud, it did not fit the theme or environment of the restaurant. We heard things like Britney Spears and Kesha over the radio when thats the last thing you'd expect from a higher-end place like Porters on the Lane. I highly doubt we will be back. It's just not the kind of place we are into.